WASHINGTON (Sputnik) - President Donald Trump will not back down from his tough stances as the United States and China resume trade talks later this month, White House Economic Adviser Larry Kudlow told CNBC News on Thursday, as he confirmed that a Chinese delegation will visit Washington later in August. "The Chinese government, in its totality, must not underestimate President Trump's toughness and willingness to continue this battle to eliminate tariffs and non-tariff barriers and quotas, to stop the theft of intellectual property and to stop the forced transfer of technology," Kudlow said, adding that the current trade dispute would continue if Beijing does not make the changes the United States has requested. Kudlow said his office would be involved in the upcoming talks, but he also confirmed that the US delegation would likely be led by Undersecretary of the Treasury for International Affairs David Malpass, a lower-ranking official than those who represented the United States in previous rounds of negotiations. China has said it will send a lower-ranking official to the talks, Vice Minister of Commerce Wang Shouwen. Previous talks were led by two higher-ranking officials, Treasury Secretary Steven Mnuchin and Chinese Vice Prime Minister Liu He. This will be the fourth round of talks on import duties since February. The last round of talks was held in June and did not lead to a breakthrough. The White House adviser went on saying that the strong dollar is a sign of global confidence in the US economy. "It is a signal of global confidence in the US," Kudlow, the director of the White House National Economic Council told CNBC. "There's a lot of unrest around the world. Money is flowing into the US. That's terrific." Kudlow noted that a strong dollar should lead to lower commodity prices in dollars, thereby benefiting American consumers. US President Donald Trump earlier on Thursday also hailed the strength of the US currency, saying "Money is pouring into our cherished DOLLAR like rarely before." The US Dollar Index, which measures the US currency against other major currencies, has risen by almost 5 percent since last year. The United States and China have imposed billions of dollars worth of tariffs on each other's imports in an escalating trade war. Last week the Office of the US Trade Representative announced it had finalized new tariffs on $16 billion worth of products from China that would be subjected to a 25 percent tariff. US Customs and Border Protection will start collecting these duties on August 23. 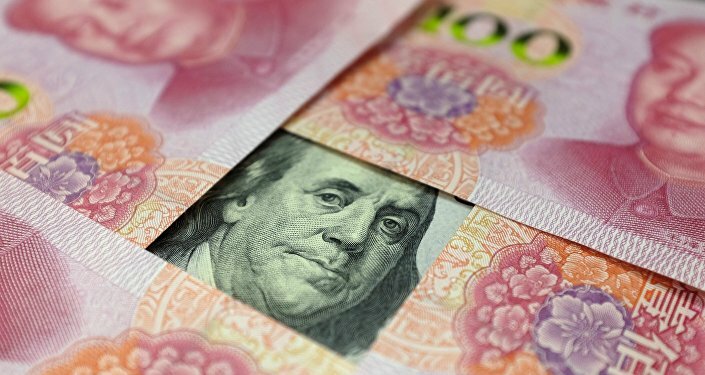 The first tranche of tariffs on $34 billion worth of Chinese imports went into effect on July 6, the release added. READ MORE: Going Nuclear: Will China Dump US Bonds, Dollar to Stop Trump's Trade War? Last week, China responded to a proposed tariff increase from 10 to 25 percent on $200 billion worth of Chinese products with a threat to impose duties of up to 25 percent on US imports worth $60 billion. The US-China trade dispute started after Washington imposed steep steel and aluminum tariffs and banned exports to Chinese telecommunications company ZTE. How Are China and EU Fighting Back Against Trump's Trade War?